Narrowband lasers use intra cavity wavelength dispersive elements to line narrow the free running spectral range of excimer lasers. Line widths of less than 1pm are routinely obtained in table top systems. 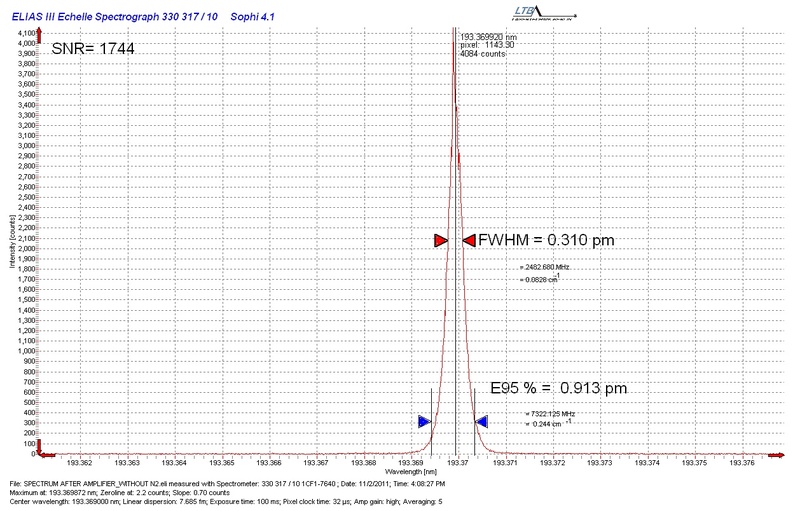 A free running excimer laser with a stable resonator produces a spectral output with a relatively wide bandwidth. For example free running ArF has a bandwidth of approximately 500pm FWHM. The spectral output can be greatly narrowed by inserting wavelength dispersive optical elements into the laser cavity . The narrow band output can also be tuned over a region which is typically close to the free running bandwidth of the laser. With both ArF and KrF line widths of less than 1pm can be obtained. Narrow band excimer lasers exhibit exceptional coherence properties. For FBG applications, BraggMaster lasers which produce high spatial and high temporal coherence are recommended. The EX50LN is available in <1pm and <10pm versions and a number of repetition rate models. with up to 10mJ of narrow band energy at 248nm and 5mJ at 193nm. Higher energy output is available from an oscillator amplifier line narrowed system which produces up to 100mJ of highly line narrowed 248nm output.